FRP Crock Pot: Go Cards! We are all astounded in AZ that the Cardinals made it to the Super Bowl. My husband had season tickets in the beginning and he could not give them away. Now people are paying thousands of dollars to see them and Phoenix is so excited. We are having a speaker on Friday, January 30 at 10 am at the AHS Museum in Papago Park, Tempe. Mack Gilchrist is a Football Official........after 37 years in the business he is still active. He has been working with the PAC 10.......Fiesta Bowl, Rose Bowl and Sugar Bowl. Sometimes with Arena Football and knows all the ins & outs of Rules and signals. For the benefit of those who love football and those who have to put up with it.....this should hold interest to everyone. 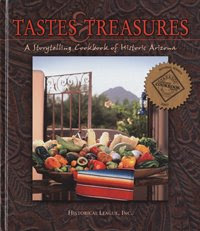 There are some really good recipes in the cookbook as well as interesting history. The Cowboy Caviar on page 180 is a favorite. Past President of the League, Bonnie Newhoff, served it at a Christmas party and the men loved it. And it is so easy to make.